The Environment ultimately dictates the outcome of all agricultural endeavors. As such, we are firmly committed to improving the biological health of our soil and reducing our ecological footprint on the planet as a whole. Steps we take include, but are not limited to, our Organic Certification since 2011 with CCOF; using wood chip mulch and bell bean cover crops; sourcing plants and selling produce locally; producing all of the power for our home and wells via our 6KW solar array; watering our row crops using water hauled from the artesian spring on our property; using California Organic Fertilizer’s Plant Extract (100% vegetarian) as our sole fertilizer. We also maintain 3/4 of our land (~15 acres) unfenced for wildlife. This includes removing invasive species and controlling woody brush loads to reduce fire danger and encourage the growth of forage and native plants. Lots of shots of critters can be found on our Game Cam page! The Silo, which houses us, once held hops at Falstaff Brewery Plant No. 6 in San Jose. Falstaff purchased the San Jose Plant from Pacific Brewing and Malting in 1952. 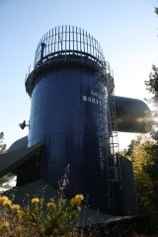 The plant closed in 1973 and was torn down in 1980, at which point the silo was disassembled and moved to its current location. Read more about its history here. The Cat Family, Opal (now at a neighbor’s farm) & her late brother Jasper, came to us as kittens from Tennyson High School Farm, Hayward, California in June 2009. Soon after his first birthday, Jasper fell victim to coyotes. Three days later, his sister birthed three beautiful kittens of her own, Luna (top left), Casper (also moved away with his mother) & Chloe (not pictured here). Soon after her first birthday, Chloe gave birth to a litter of her own: Domino (top right), Lionel Tiger (bottom left), Pearl (middle) and Lola (bottom right). 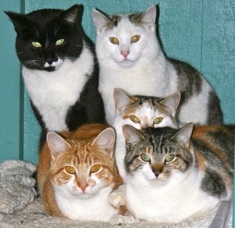 The six remaining cats roam the farm as a family: hunting, playing and sleeping. 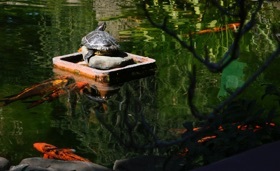 The Koi and Red Eared Slider Turtle are integral to the ecosystem of our farm. On top of providing the children with hours of entertainment, their pond serves as a breeding ground for Coastal Range Newts, California Red-Legged Frogs and Pacific Tree Frogs. The later serenade us with their love songs throughout the spring and summer months. 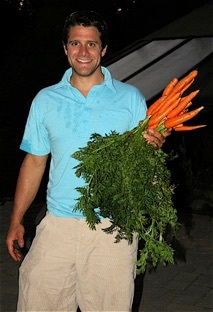 Daniel is farm manager and co-founder of Abounding Harvest Mountain Farm (AHMF). After graduating with an Sc.B. in Geology/Biology from Brown University, he spent three years working at Four Season Farm, Harborside, Maine for Eliot Coleman and Barbara Damrosch. He moved on to get certified as an instructor in Kundalini Yoga, which he has practiced since 1998. He then worked for the Yogi Tea Company and lived in Española, New Mexico in a yogic community. Daniel’s westward progression led him next to UC Berkeley, to become a certified CAADAC Substance Abuse Counselor. There he gained employment at UCSF doing counseling and research. Many clients later, Daniel was ready to get back to the soil. He moved to Santa Cruz, California and went through the Apprenticeship in Ecological Horticulture at UCSC’s Center for Agroecology & Sustainable Food Systems (CASFS). He served on their Friends’ Board of Directors from 2008-2014, including three years as Board President. 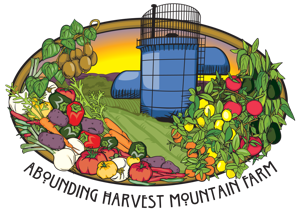 In 2006, Daniel and Nancy acquired a former pear orchard in the Santa Cruz mountains with the intention of starting a farm. They were married on their land, and their family and orchards followed. In Daniel’s free time he manages the forest, combatting invasive species, erosion, and sudden oak death. He also makes steel sculptures to incorporate into the landscape. Sartaj is a Polish Tatra Sheep Dog from Gnu Hampshire Farm. He keeps the bobcats, coyotes and raccoons at bay and also has a taste for gopher. 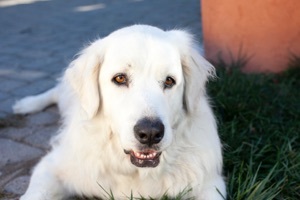 Though his bark is loud, he is a gentle giant, whose antics keep us constantly amused. The Pekin Ducks, which served as our egg layers, have moved on to the great duck house in the sky. As with our previous flock, we had picked them up as day-old hatchlings from Metzer Farms Hatchery. 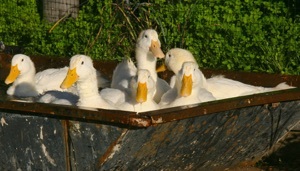 Evidence of Pekin duck domestication dates back to at least 2500 BC, and it showed! They were quite docile, polite, and quick to catch on...except to coyotes. 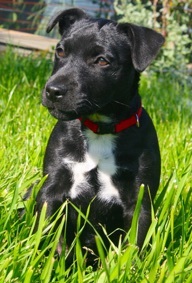 Ziggy is our Patterdale Terrier. He hails from Lost Lake Farm in Paisley, Florida. A ratter by trade, his blood relatives worked the White House during the Obama Presidency. He is quiet, fleet of foot and can wreak havoc on a Kong. Seven Hens now provide our eggs. 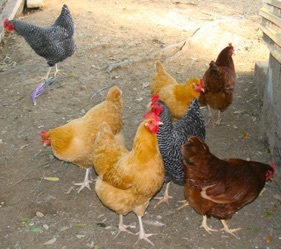 There are two Barred Plymouth Rocks, two Rhode Island Reds, and three Buff Orpingtons. We bought seven in case one turned out to be a rooster. The children adore them, and the feeling is mutual.